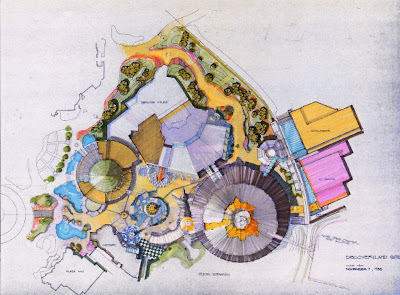 Here is the awaited third part of this “Disneyland Paris that never was“ article, in tribute to this wonderful park. And this one should make happy the 17% of the 220 voters of my Disney and more poll - the one you can find at the bottom of each page - who have said that they like on "Disney and more" articles about "theme park and attraction artwork". If you didn't vote yet, it's still time to do it! 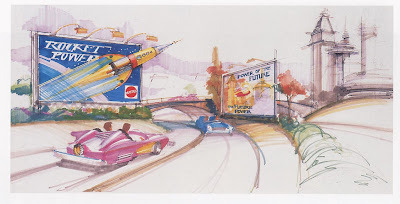 So, let’s have a look today to the early projects for Discoveryland, as, as you will see , big changes - i should say “choices” - have been done. But first let’s say that DLP’s Discoveryland is beautiful. Could had it been better with some previous concept, like “Discovery mountain”? I am not that sure. 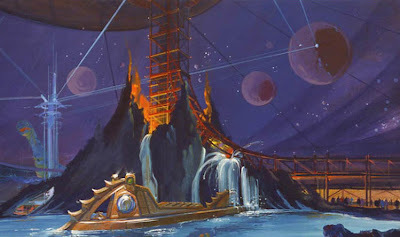 As we will see below, i think that the Nautilus, for instance , is better outdoor than indoor, and that the size of Space Mountain is perfect. 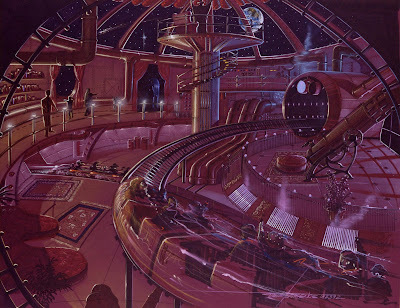 When the imagineers decided to built Discoveryland in Paris , a land tribute to visionaries like Jules Verne or Leonardo da Vinci, they wanted a whole different concept than the usual tomorrowland,and , above, here is an early concept for Discoveryland’s entrance. 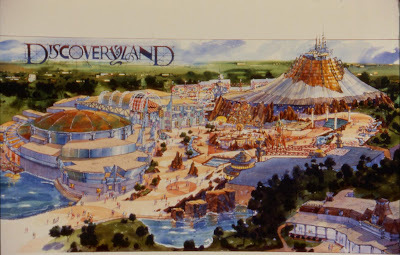 On these other pictures one you can see a whole view of the land , including what was then Discovery mountain. Let’s talk about this Discovery mountain project: it’s difficult to imagine something more huge than this project. 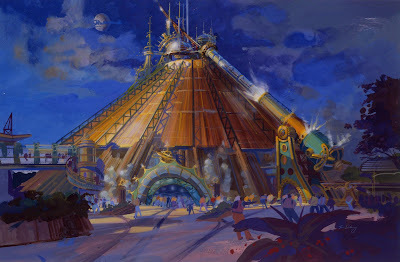 Not only , the building wasgoing to be 100 meters in diameter - instead of the 61 meters of the actual space mountain - but you will have found inside : a large version of the Nautilus, , an underwater restaurant themed on the “Nautilus” theme, an atttraction named “Horizons” , a café, the Disneyland railroad station, and the roller-coaster it self, of course! And not to mention aerial tubes that linked to “cine magique” - now closed - and videopolis. Many different designs were produced for the exterior of this huuge building. But the closer to the final version would have been this one. as dry as possible . Because of the global warming it’s now less raining than it was before, but 18 years ago, when the imagineers worked on the concept, the rainy season in Paris could have been pretty long. So, the guests with this concept could have stay undercover. 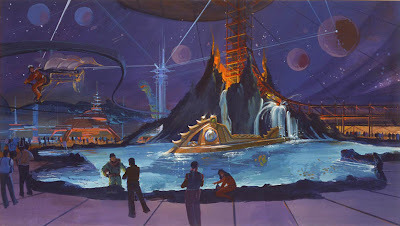 And, talking about water, one of the other great idea was that Discovery Mountain's entire interior was supposed to be lit from lights that were under water , which would have give this incredible atmosphere. ......or go all the way around the lagoon to enter the Nautilus. 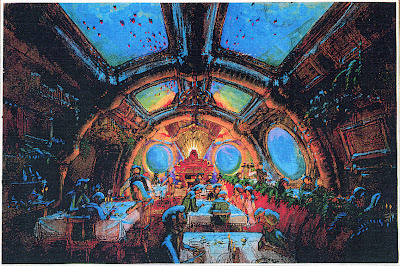 At that point , guests with reservation would have been able to dine in the fantastic “Nemo grand salon” restaurant , and through the Nautilus windows , one would have seen the ruins of Atlantis! 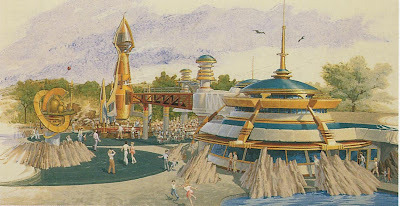 ...an idea that dates back to Tony Baxter’s Discovery bay concept in the 70’s. 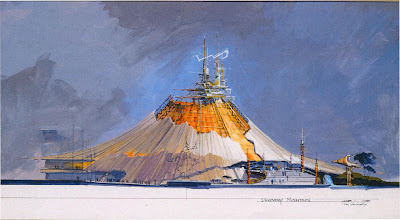 Mind you, this huge volcano you can see here with the track going out of it, was probably the first free-fall concept imagined by the imagineers , another tribute to Jules Verne and his “Journey to the center of the earth story . 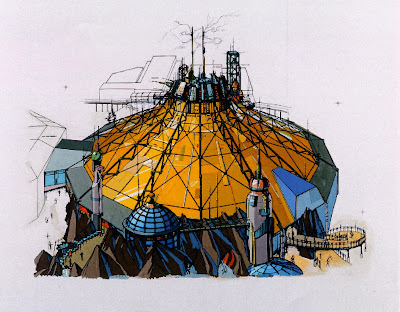 At one time , the guests were supposed to been blow up all to the top of the building ( just like in Verne’s story where they escape the center of the earth through a volcano chimney ) and had a brief look to the outside of the park before they fall down. We know the rest of the story: this “journey...” was not built, another one - and better - exist now at tokyo disney sea , and tower of terror was finally the first free fall attraction really built by WDI. Of course the cost of this Discovery mountain project became so huge, that some cuts became inevitable. We finally have this victorian version of space monutain ( always with the huge cannon) , and the nautilus is now outside - without the Nemo restaurant, this is probably what i miss the most.....Here is a final rendering of what was finally built. 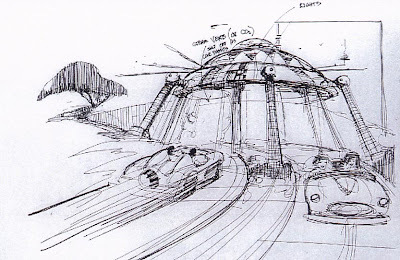 Talking about Jules Verne, a scene where he was supposed to appear in the walk-through of the “mission one” has been cancelled, too. And those of you who remember Epcot’s wonderful “Horizons” attraction will notice a similarity with this scene of Verne inside a giant bullet. 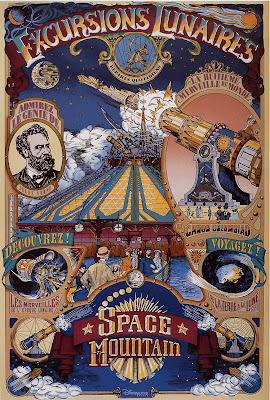 Sometime , it’s even some attraction poster that disappeared : this gorgeous one done for the first version of space mountain is now replaced by the new “mission two” poster, not as good as this one. 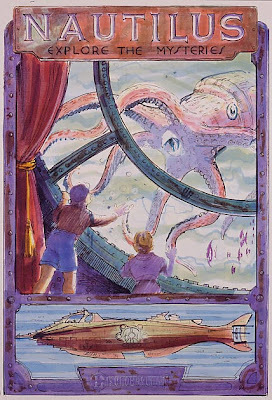 And sometime, it’s a concept of attraction poster who don’t go the end , like this sketch for the “les mystères du nautilus” attraction poster. At the entrance of star tours, now stands a big X-Wing fighter, but concept to put the huge AT walker , like the one at Disney-Mgm studios were done. ...But unfortunately not this huge UFO landing in the middle of the attraction. 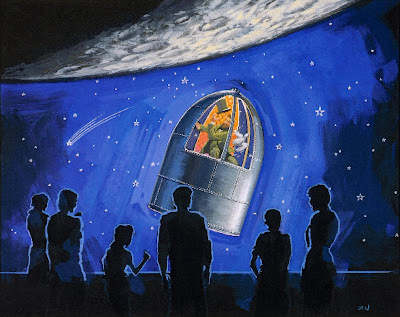 Talking about Ufo and flying saucers, did you know that they though - at least a little while - to re-birth again the now long-extinct flying saucers attraction from Disneyland? Hmmm, i wonder if these small saucers would have work better than it did in the 60’s. In the next part of this article, i will show you amazing concepts for some Disneyland Paris hotels that were never done, so don't miss it! Don't completely agree with that statement, but I do appreciate you continuing this series.